For all you folks suffering from pollen allergies, Google is now providing pollen forecasts via Google Search. 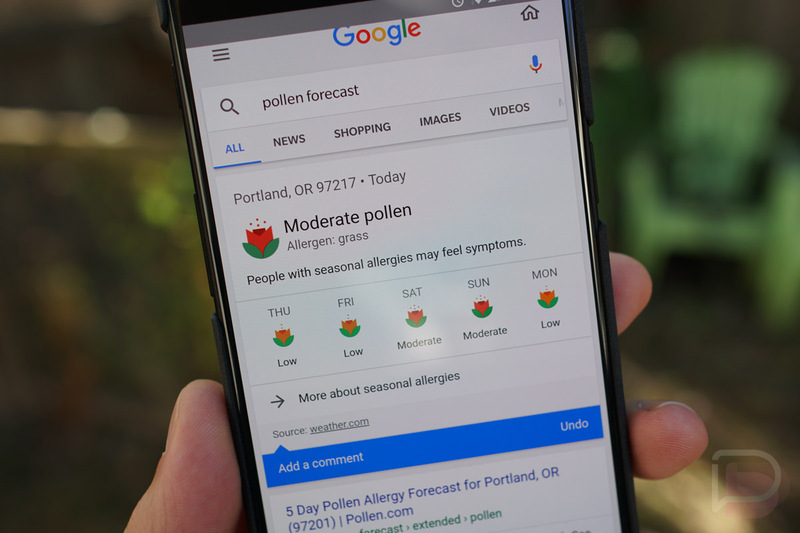 To fire up the forecast, simply say, “Pollen forecast” into Google, then get all of the info delivered right to you. The forecast shows five days, what type of allergen is likely to bug you (example: Grass), and tells you whether folks with allergies may experience symptoms that day. According to Google, this info is pulled directly from Weather.com, so you can rest assured that the info is as accurate as possible. Additionally, if pollen gets high in your area, you can receive reminders inside of the Google app to help make you aware before it’s too late.